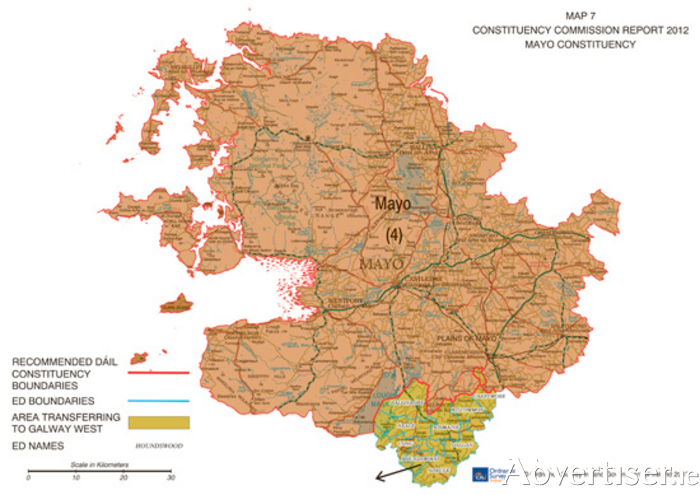 Fine Gael councillor Patsy O'Brien is encouraging people and community groups in south Mayo to make submissions to the Constituency Commission by next Tuesday to try to get the portion of the south of the county that was bundled in with Galway West for general elections brought back into Mayo for future elections. Speaking to the Mayo Advertiser this week, Cllr O'Brien said: "I've made a submission on it and I'm encouraging people or groups to make one too, it has taken up a lot of time discussing this with people and groups over the past few months. I didn't say anything until after the General Election last year, because I didn't want to affect or discourage anyone running from here in the constituency." Not long after the election, Cllr O'Brien put forward a motion at a Mayo County Council meeting calling for the change to be reversed, he got full support from all sides of the house saying at the time that south Mayo had become a "political island". Pointing out some of the oddities of the changes he told us this week: "There's two pubs in the village of Robeen, one of them is in Galway West and the other is in Mayo, it's crazy stuff like that," and when it comes to local government management he said, "Even at a local level, my parish one third of it is in the Castlebar Municipal area and two thirds in Claremorris Municipal area." He added: ""People are feeling they are missing out on funding and other things, because they are not in Mayo and they are just the tail end of Galway West. I'm working with TDs from Galway West all the time and in fairness to them they don't know if they are coming or going themselves next election," and, "The people don't know if they are coming or going or where to go at times." He also pointed out that the changes were brought about on the figures that came out of the second last census and since then things have changed again, "If you look at it, it was over 10,000 votes that are in this part of Mayo that was put into Galway West, sure after the latest census figures Galway city's population went up by over 4,000 from the one before and that's almost half the votes, they don't even need us in Galway West anymore. "It's not like in a city like Dublin where they move a street here or there, this was community and villages split up, neighbours in rural areas ending up in different constituencies, they just want to be be kept together." Mayo was reduced from a five seater to a four seater in the last General Election and O'Brien said: "I don't mind if Mayo is kept as a four seater, it's about having Mayo kept together. It's not like in a city like Dublin where they move a street here or there, this was community and villages split up, neighbours in rural areas ending up in different constituencies, the just want to be be kept together."